If you've been following this blog for any length of time you've probably noticed that I love quirky, off the beaten path documentaries. I also really love NPR. Having a knowledge of both allows me to smugly look down upon the unenlightened masses thanks to my superior cultural understanding. Not really, but when I think of people that watch quirky documentaries and listen to NPR I imagine that's how they act so maybe I should work on fitting that stereotype. This American Life is a Showtime series brought to you by Ira Glass, also known as "that guy from NPR" (I was going crazy for the first few episodes trying to figure out where I knew him from). 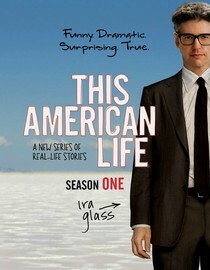 If you're unfamiliar with Ira Glass, he hosts a radio show on NPR called, coincidentally enough, This American Life. He is always able to find strange, interesting and insightful stories that you wouldn't think would be interesting but end up being totally engrossing. He's essentially a young liberal's Paul Harvey. This Showtime is series is an extension of his radio show and thanks to new technology, adds moving pictures. I have to admit that once I watched the first episode I was completely hooked and may or may not have watched both seasons in about three days. The stories range from hilarious and thought-provoking to heartbreaking and anger inducing. If you enjoy hearing random stories about random people doing interesting things I cannot recommend this series enough. To add Season 1 to your Netflix queue click here. To add Season 2 to your Netflix queue click here. According to instantwatcher.com this series will be available to stream on Netflix until 7/01/11. Why is it in your queue? Shelly from Shelly Talks Too Much was twittering about how addictive it was. Is it artsy? No, unless you think all documentaries are artsy. What stood out the most to you? There were a lot of great moments but the old man who hangs out at his dead wife's grave was full of aww. What mood should I be in to watch this movie? In the mood to be moved to a number of different emotions. I am a huge fan of the radio show, and a modest fan of the TV show. My favorite episode is where J-Depp did the narration for a young kid who couldn't speak. Amazing.